Black is my signature colour. I love black. White on the other hand is not a colour I have a lot of in my wardrobe. It’s not that I despise white, but when I wear white, things tend to be spilt on my clothes. White is a stain magnet for me, which is why I tend to avoid it. 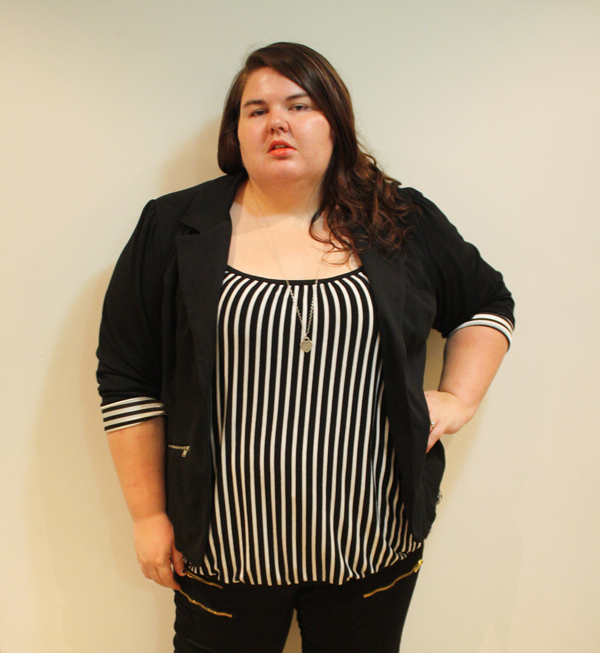 So for black and white week, for me, it tends to also mean stripes. So as an added bonus, this is also my stripes catch-up post. Yay! This outfit is a fairly typical work outfit for me. Usually I will pair a top with jeans and add my blazer or cardigan. The top itself is a bubble-hem singlet. I actually have three of these now in different colours because they can easily be dressed up or down in summer, so I can wear them to work or with shorts over the weekend. Bonus is that they hide the lumpy bits and give me a smooth line. This might be in part to the fact it is double-layered material. I paired the singlet with my new All Zipped Up skinnys. They fit really well and I love the zips. Unfortunately, the day I wore this outfit one of the zips got caught in the entry barriers at the train station and ended up ripping one of the zippers off. I’m yet to figure out how to re-attach it as I need something strong to force the metal back around the zip teeth. Pliers are most likely needed. Sometimes I wish I had my Dad’s toolbox handy. 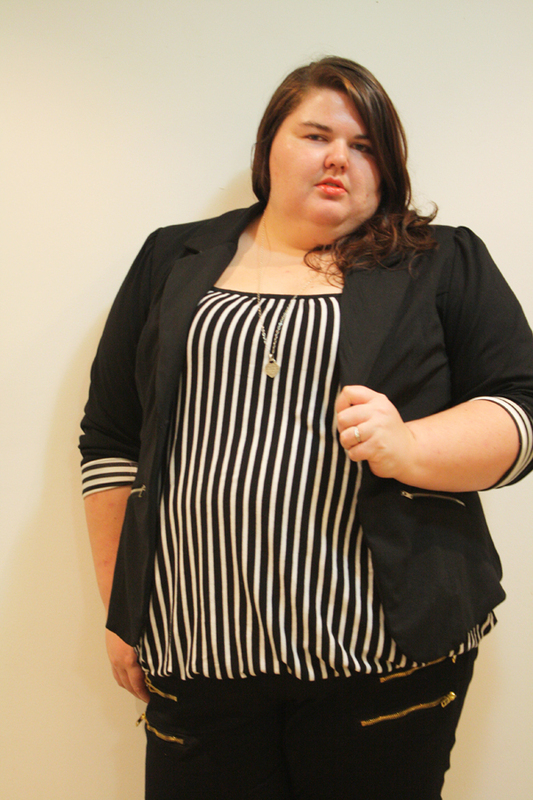 I already featured this blazer in my Pink post and I actually can’t praise it enough. When I first bought it, it was a time when I really shouldn’t have been buying anything (in the few weeks before moving to Australia. Tsk tsk.) But I got it on sale, so all is justified, right? Anyway, it has become a staple in my wardrobe and I wear it multiple times a week. It has really been one of the best buys I have ever made. Also, I will reiterate, I think City Chic needs to make it a staple in their line, because black blazers are always a closet must-have. Plus the stripped lining is awesome. I am wearing one of my new favourite lipsticks as well. It’s almost not a lipstick, it’s a lipgloss/lipstick mix. It’s L’Oreal Paris Shine Caresse in ‘Princess’, which I got from the October Bellabox. I love it so much that I went down to the Priceline make-up sale and bought it in ‘Milady’ as well, which is a purple-y colour compared to this coral-ish one. This week has been so busy and hectic, I am so glad it is the weekend. I had good intentions of getting this post up earlier than today, but alas, apparently my social life decided to kick in. I actually can’t describe how exhausting it is when you go out three nights in a row and don’t get home until after 11 on all three nights. 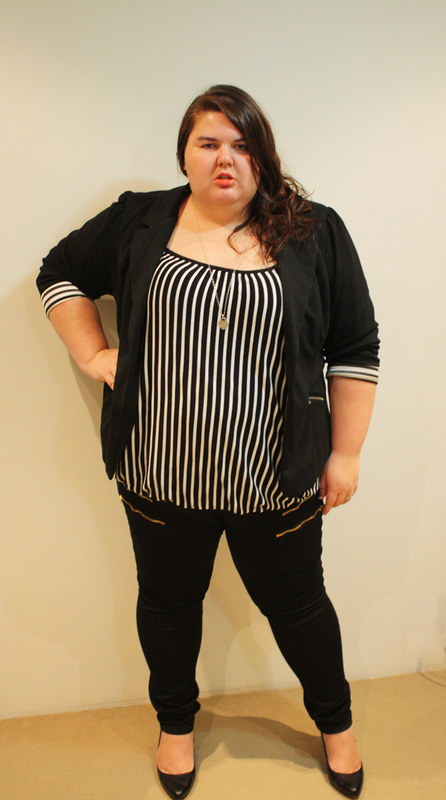 Anyway, that’s me for black and white week (and stripes). A bit of a shorter post than usual, but my brain is not functioning at 100% right now. 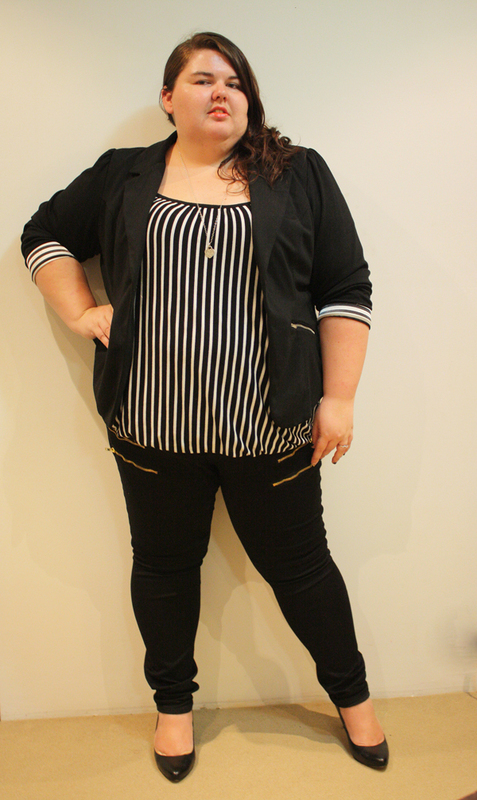 Make sure to click on the link below to see what the other Aussie Curves ladies put together for their black and white outfits. Babe, I am totally loving your outfit photos right now. I’ve gone off City Chic (so exy) but you always look so fierce! Thanks Jen! I know what you mean by expensive. I don’t know how I manage to afford most of. Probably because I never buy anything else? Very rock-chic and I love it!! Thanks! I do love my rock-chic style! Haha. I LOVE this outfit!!! And I spy your fab Target shoes! Thanks Kat! I will have to keep it in mind for pairings. Great outfit! Loving those jeans, sorry to hear about the zip catch incident. Hope you figure it out shortly!